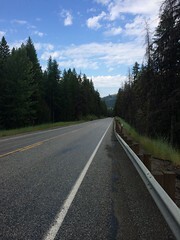 Day 11 | Republic to Colville | frank-holdem | Le Tour de U.S.
We awoke at 5:45 am this morning to dark thundering skies, loaded our bikes and proceeded to Subway for breakfast. While waiting for Subway to open we discussed whether or not we should wait for the dark clouds to pass or whether we should proceed regardless. By the time we finished breakfast we opted to wait a while to see if the dark clouds would pass. And indeed they did. 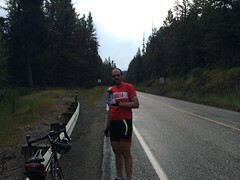 By 8:30 the skies were beginning to clear and we began our ride. 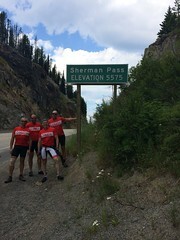 After a 5 KM descent from Republic we began the journey up the Sherman Pass. 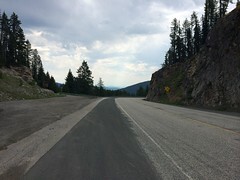 It took 23 KM of climbing to reach the summit of the Sherman Pass, named after the American civil war general, William Tecumseh Sherman. And coincidentally we ran into Etienne and Kirsten, the Dutch couple that we met a couple days ago. 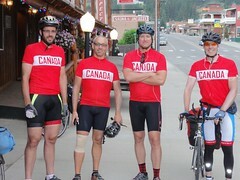 After a short chat and a few photos we enjoyed a nice 34 KM descent that took us almost all the way to Kettle Falls. 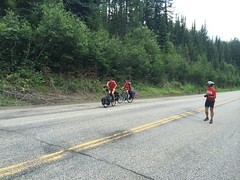 Near the end of the descent Trevor encountered some difficulties with his chain which required some investigation. Some grass has wound itself into Trevor's rear chainring and it somehow caused one of the pins in his chain to pop out of place. 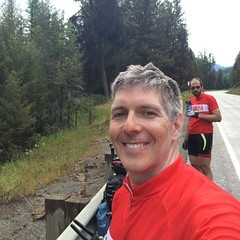 Fortunately James "The Mechanic" Nicholls was able to fix that using his chain tool and that allowed us to continue along to Kettle Falls where we stopped for a short snack before completing the final 30 minutes of riding to Colville. Overall, it was a relatively easy day due to the cooler temperatures and short distance. After getting settled into our motel Trevor took his bike to the local sports shop which sells an interesting assortment of bikes, guns, knives, and various other sporting goods. 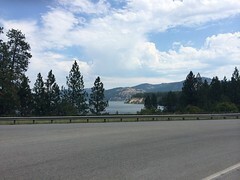 The mechanic concluded that the best short-term solution to the chain problem was to remove one of the links and then to replace the chain, rear cassette, and front chainrings when we reach a larger town. 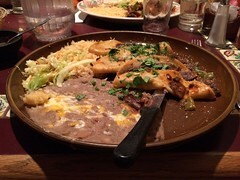 We attempted to have dinner at a local steak house but sadly it was closed for some restoration work so instead we went to a Mexican restaurant which was recommended to us by one of the ladies at Safeway. Dinner was delicious, but the highlight for me was getting to wear the giant sombrero that is only bestowed upon those who are celebrating a birthday. 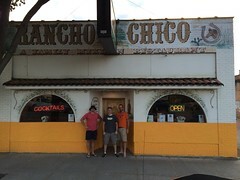 And the boys very kindly picked up my dinner tab. Good times! 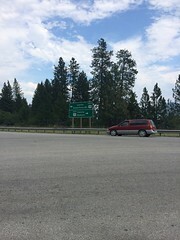 Tomorrow we plan to ride to Sandpoint, Idaho, which is approximately 150 KM. 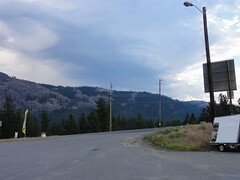 another day, another mountain pass. We're getting good at these. 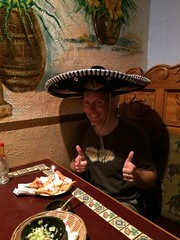 Sweet, I get to wear the birthday sombrero!